Mr. Drum patting the horse on the opposite side of his chest. I let out a sigh of relief and continued listening. The owner, seeing my reaction, stopped mid pat and with a sheepish look, moved to rubbing the horse’s neck. I returned to listening to his heart (thankfully no arrhythmia), lungs (clear), and lastly gut sounds when I heard a familiar murmuring. I closed my eyes…still murmuring. 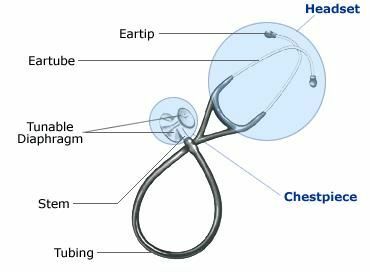 I squeezed my eyelids and pinched the stethoscope so the ear pieces pressed firmly in my ears (faint gassy pings but overall decreased). I took the stethoscope completely out of my ears as I noticed the owner looking my way “Sorry I missed what you were saying.” “Sorry, you were listening” he said with recognition “I can wait.” “I’m all done” I said and placed the stethoscope around my neck. “I was just going to tell you he did drink water last night. About a half bucket” the owner added. “Good deal, his heart and lungs are normal, gut sounds are quiet with faint gas sounds. I’ll see what he feels like on palpation and we can make a treatment plan from there. By the way, where is your wife?” “She’s out of town” he said with a chuckle. At the end of the day, Chubbs did great and Mr. Drum stayed well out of the doghouse. One, even though we have two ears we can really only hear one thing at a time. Two, don’t feed your colicky horse immediately after giving him Banamine® or you may end up in the dog house. And three, you can give the horses water but if mom leaves someone is going to colic.